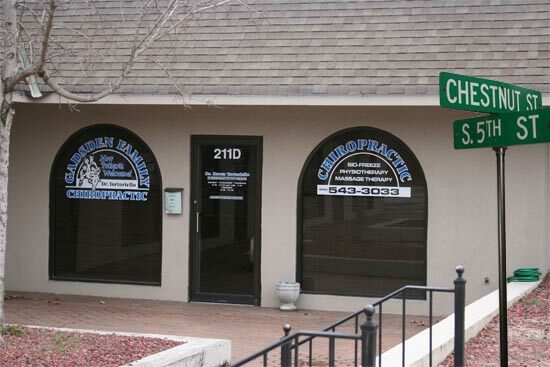 Welcome to Gadsden Family Chiropractic, in downtown Gadsden. We deliver personalized quality care for children, students, adults, and senior citizens. Eight out of ten Americans will have back pain in their lifetime. Dr. Karen Brockway enjoys treating people of all ages. From birth to old age, our bodies are constantly changing. Everyday living takes a toll on our bodies, causing minor trauma to the spine, ligaments and muscles. Chiropractic care can help keep your spine healthy so you can keep going for the next 30, 40, or 50 years. At Gadsden Family Chiropractic our main goal is to help you get out of pain and establish a healthy lifestyle. Acupuncture, spinal decompression, cold laser therapy, muscle stimulation, diathermy, hydro therapy and x-rays are available on site. Gadsden Family Chiropractic will bill your insurance for you. Most personal injury and work injury accepted. Dr. Tortoriello looks forward to meeting the diverse health care needs for you and your family. Contact us today!